Picking a brand of cat litter can be tough. There are so many choices with so many different features. How can you possibly know which one is best for your cat? If your cat is picky about her litter, you might find it beneficial to set up several boxes with a different kind of litter in each. She may prefer a specific feel under her paws, or she may have a preference for clumping vs. non-clumping litter. I have two cats: one who will use pretty much any litter that we put out for him, and one who is very picky about what goes under his feet. I’ve tried a whole bunch of different brands, and these are the three best cat litters that I like best. I love the Tidy Cats clumping litter brand. It’s so much easier to scoop and clean a litter box when the litter actually clumps together. Otherwise, you get tons of tiny pieces that you can never quite clean up. 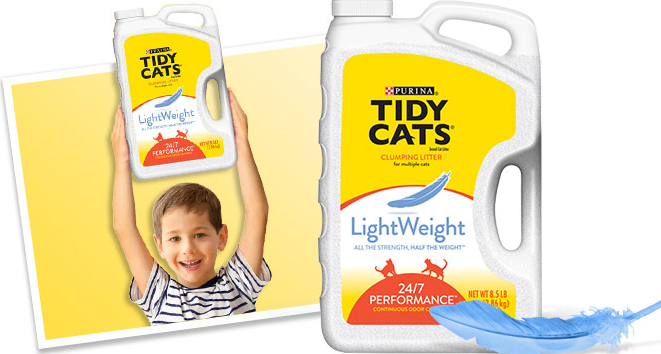 The Tidy Cat Lightweight Litter is amazing. I no longer have to lug around super heavy containers of litter (although, if I considered it part of my workout, I guess it might be a good thing!) The lightweight version is about half the weight of the regular kind and works just as well. Now, here’s one word of warning. The litter, because it’s lighter, does kick up a little more dust. So if your cat has allergies or asthma, it might not be the best choice. Also, if you’re choosing between the lightweight “24/7 Performance” version versus the “Instant Action,” I haven’t seen much difference between the two. They both work great. Dr. Elsey’s Precious Cat brand has a type of litter that’s simply called “long-haired cat litter.” It consists of larger crystals mixed with an herbal cat attractant. I have a long-haired cat who is pickier about his litter. Over time I realized that the regular litter kept getting stuck to his fur and he hated that! This can especially be a problem for cats who have tufts of fur growing around the bottom of their paws. Now, keep in mind that this brand is not a clumping litter, but it’s totally worthwhile if you have a finicky cat. As for my cat – the long-haired litter worked like a charm! Normally very picky, he immediately took to this litter and began peeing in the box all the time. 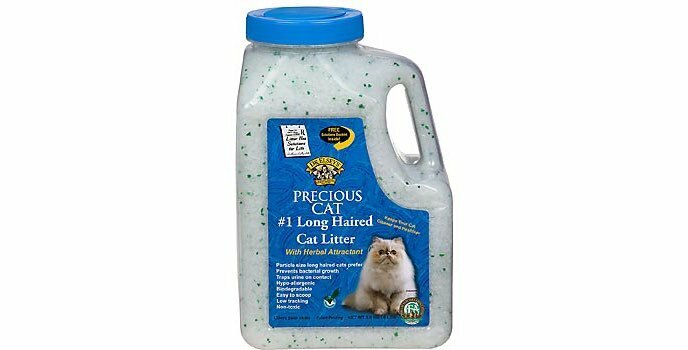 If you have a long-haired cat and this brand isn’t available, look for another brand that has white crystals for the litter, particularly if the crystals are a little bigger. Dr. Elsey’s also makes clumping litter with an herbal attractant mixed in, but these aren’t designed especially for long-haired cats. The CatGenie is a self-flushing cat box filled with special washable granules. It has to be hooked up to an electrical outlet and a cold water line in order to work. It automatically scoops the litter box and cleans the litter, so you never have to touch it. 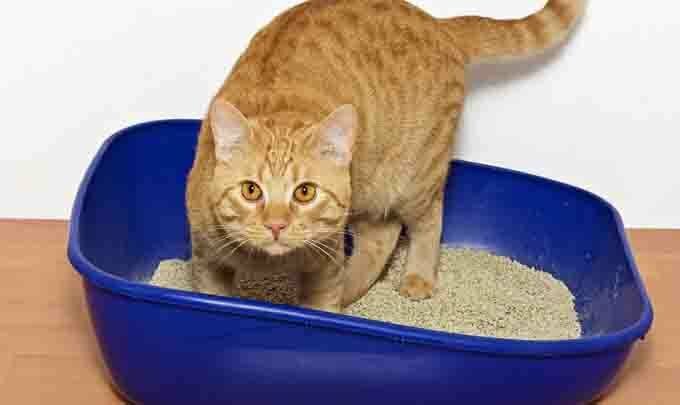 Now keep in mind, the litter box is more costly than a regular litter box and so are the granules, so you’ll be making an initial investment to get it up and running. For one cat, a box of granules will last three months, so you’ll actually be saving money in the long run. Why do I suggest that if you buy this, you need an out-of-the-way place to keep it? Well, the box has one unfortunate side effect: it’s stinky! When it’s in cleaning mode, it’ll stink up whatever room it’s in. So you don’t want to set it up in the guest bathroom or in a room where you’re entertaining. But imagine the freedom of only having to change the litter every three months. It’s amazing! Ultimately, when picking a litter brand for your cat, you should choose one that matches her breed and unique personality. A finicky cat may need a cat litter with an herbal attractant. An easygoing cat might be fine with a noisier self-cleaning box that frees you from the daily chore of cleaning. Just remember, the general rule of thumb is that you need one litter box per cat, plus an extra box. This makes sure your cats always have access to a box and no one feels intimidated. I would love to hear any feedback you have on other brands or types of kitty litter. Please share your experience in the comments below so that other cat owners (like myself), can learn from your experience.